Works in conjunction with Weight Loss Formula or Advanced Fat Burner. Affects satiety and basal metabolism. 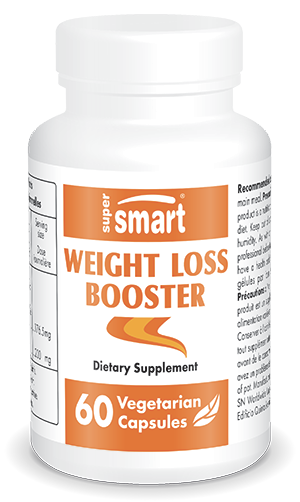 Weight Loss Booster is a completely new formulation that’s simple and natural. It is designed to boost the action of Weight Loss Formula or Advanced Fat Burner, by mobilising two complementary weight-loss mechanisms: appetite control and increased base metabolism. Weight Loss Booster combines two natural substances shown to be effective in recent clinical studies. • In one, subjects who supplemented with Satireal® for 28 days experienced a reduction in food intake associated with an increased feeling of satiety, as well as a loss in bodyweight and fat mass, compared with a placebo group. The study also indicated a decreased desire for, and consumption of, food. • In the second, more recent, double-blind study, subjects were given supplements for two months after which a significant loss in bodyweight was noted, as was a 55% reduction in compulsive snacking. By the end of the study, a loss of almost 70% was reported in feelings of hunger, combined with a total absence of desire to snack between meals. ¤ Raspberry Ketones is a new slimming ingredient that has become popular in the United States after being endorsed on the well-known Doctor Oz television show. These natural ingredients are responsible for raspberry’s taste, but you would have to eat 15kg of raspberries to obtain the same amount of ketones necessary for its slimming benefits. Ketones are chemically close to capsaicin in chili peppers and similarly help to raise the body’s base metabolism and thus burn more calories for no extra physical effort. • Raspberry Ketones affect metabolism by stimulating production of two hormones : norepinephrin, which naturally increases thermogenesis and thus fat-burning, and adiponectin, which helps reduce excessive blood sugar levels. Overweight individuals are always deficient in adiponectin; increasing it – as can also be achieved with Irvingia – appears to be one of the best ways of reducing insulin resistance and diabetes. • According to one animal study, Raspberry Ketones can even prevent part of the weight gain normally associated with a high-fat diet. This suggests it can effect a change in metabolism and increased burning of brown fat deposits to produce energy. . If you already take one of our cutting-edge slimming formulations, Weight Loss Booster will provide a safe boost to give your diet a ‘kick start’ or help if it has hit a plateau. Other ingredients :maltodextrin. Satiereal®, Inoreal, France. adults. Take two capsules a day, one before each main meal.